Good news for poster lovers: the Maryland Institute College of Art (MICA) is purchasing about 75 percent of the Globe Poster Company’s working collection of wood type, images, and illustrations. Based in Baltimore, Globe was one of the pre-eminent letterpress printers in the United States. Though not as old as Hatch Show Print in Nashville, which has been around since 1879, Globe produced boxing-style letterpress posters for everything from burlesque acts to rhythm-and-blues revues to rap concerts from 1929 to 2010, when Globe finally closed its doors. One of the visual styles that Globe is best known for is the jam-packed poster in which each act gets its own little eye-catching “cloud” of color with its name on it. Sometimes the posters were also sprinkled with photos. 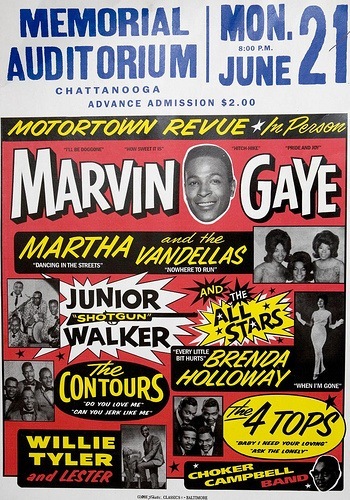 That way, a customer could see at a glance that an upcoming show at, say, the Memorial Auditorium in Chattanooga would feature Marvin Gaye, Martha and the Vandellas, Junior Walker, the 4 Tops, and many others (admission to this “Motortown” revue was just two bucks). The collection that’s heading to MICA includes posters, of course, more than 350 drawers of wooden type, and some 5,000 letterpress “cuts,” many of them hand-carved. What it does not include are the presses themselves, which range from a pair of 5,000-pound Miehle presses (these hand-fed beasts could print 500 to 800 posters an hour) to numerous smaller Heidelberg presses. 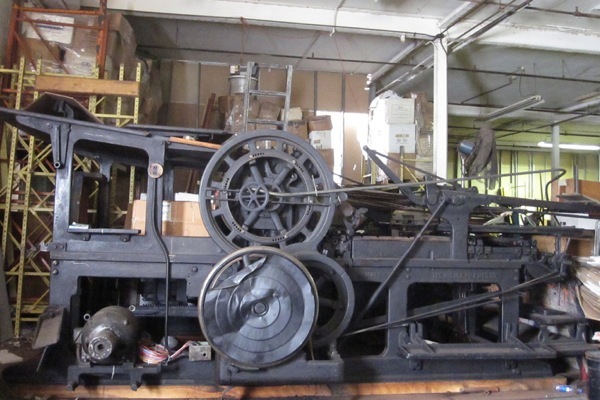 This 5,000-pound Miehle press is just one of several remaining at Globe. The subjects of posters printed by Globe ranged from bluesmen to motorcycle daredevils to strippers.